Protect your glass from rain, sleet, ice, snow and other contaminants! Protection that last for up to 2 years! The Gtechniq G1 ClearVision Smart Glass will protect your glass from harmful environmental contamination with ease! G1 is built on the same nano-active technology as the innovative C1 Crystal Lacquer and some of the other popular Gtechniq coatings. This coating will bond with the glass to create a slick protective barrier from the harmful elements. One coat on your windshield will typically offer up to 30,000 miles of water, dirt, ice, and contaminant repellency. This is highly beneficial as you will have significantly improved visibility, less time spent removing ice, and an easy to clean surface for years to come! Apply G1 to your windshield and any other glass surfaces you may have. 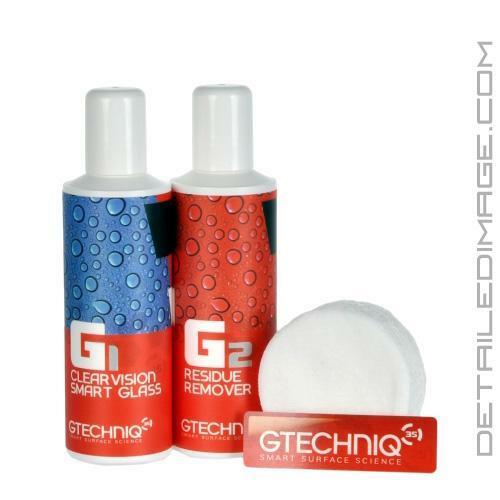 This glass coating also comes with the G2 Residue Remover to help remove the reside left over after you apply the G1. Protect your glass surfaces with the amazing Gtechniq G1 ClearVision Smart Glass! G1 ClearVision Smart Glass is a revolutionary water repellent coating that uses an ultra durable chemical bond to adhere to the surface of your vehicle glass forming a hard and super resistant water repellent film. G1 ClearVision Smart Glass excellent durability and exceptionally low smear characteristics make it ideal for car windscreens with a single application lasting approximately 30,000 miles driving. G2 Residue Remover is to be used to assist the removal of hardened residue from G1 ClearVision Smart Glass. I got my windshield replace and thought about a good protection. Reading all this good reviews and watching all the videos about it i thought why not give it a shot. Best chose I've made for protecting my windshield....water beading is great, application easy I think I over did a little bit .I bought the small package and could cover only the windshield and my back window. But still amazing results. This is the second time I've purchased this product and used it on our cars. I got the smaller bottle and it's just enough for two cars, although I wasn't able to apply as much of the G1 on the second car. Application takes time, but the first time I applied it, it lasted for ~1.5 years. Truly a great product, and miles better than rainx. Rainx would last me a couple car washes at most, and it'd make my windshield wiper chatter at higher speeds. I would totally purchase this product again, although I wish the G1 bottle came in small spray bottle for easier application. Quick tip: Put the G2 residue remover into a separate bottle with an atomizing sprayer. You will thank me later. Applied G1 to my 1999 Toyota 4runner front windshield after prepping with a wool pad and M105 and of course an IPA wipe down. Results were great. Again G2 needs to atomize in order for you to get the most out of it. If you use this method then you could probably get a couple cars done with the 100ml package. Great one stop shop for products and advice.